Pioneering digital technology company ABB today announced a major, new US$150 million investment in Shanghai, China to build the world’s most advanced, automated and flexible robotics factory - a cutting-edge center where robots make robots. The new Kangqiao manufacturing center, near ABB’s expansive China robotics campus, will combine the company’s connected digital technologies, including ABB Ability™ solutions, state-of-the-art collaborative robotics and innovative artificial intelligence research to create the most sophisticated and environmentally sustainable “factory of the future.” It is expected to begin operating by the end of 2020. Today’s announcement marks a significant milestone for ABB as China’s #1 robotics manufacturer as well as a critical global growth investment for the company in the world’s largest robotics market. In 2017, one of every three robots sold in the world went to China, which purchased nearly 138,000 units. Today, ABB employs approximately 5,000 people in Shanghai, and the company’s robotics businesses in China employ more than 2,000 engineers, technology experts and operational leaders in 20 locations across the country. ABB has invested more than US$2.4 billion in China since 1992, with over 18,000 employees in total. ABB and the Shanghai municipal government today also signed a comprehensive strategic cooperation agreement focused on supporting industry, energy, transport and infrastructure in the region, and to support the “Made in Shanghai” manufacturing initiative. The agreement was signed by Shanghai Mayor Ying Yong and ABB CEO Ulrich Spiesshofer. The new Shanghai factory will feature a number of machine learning, digital and collaborative solutions to make it the most advanced, automated and flexible factory in the robotics industry, and an onsite R&D center will help accelerate innovations in artificial intelligence. Using a new, global design approach that ABB announced earlier this year, the factory will be able to dramatically increase both the breadth (type of robots) and depth (variants of each type) of robots that can be made onsite, allowing greater and faster customization to meet the needs of customers. The entire Shanghai factory will be modeled as a digital twin, which will provide intuitively tailored dashboards for management, engineers, operators and maintenance experts to make the best decisions. This includes gathering and analyzing intelligence through ABB Ability™ Connected Services on the health and performance of ABB robots in the factory to ensure early identification of potential anomalies. In addition to avoiding costly downtime, ABB Ability™ offers advanced digital solutions that can improve performance, reliability and energy usage, as well as providing access to the world’s best platforms, such as the Microsoft Azure enterprise cloud, which is the first international public cloud service operated in China. The new factory will have an innovative, flexible floorplan based on interlinked islands of automation rather than fixed assembly lines. ABB logistics automation solutions will be used throughout the plant, including automatic guided vehicles that can autonomously follow robots as they move through production, supplying them with parts from localized stations. This will allow production to adapt and scale efficiently to changes in China’s robot market without additional capacity expansions. To aid the move to mass customization in manufacturing and to ensure the highest levels of productivity and flexibility, the new Shanghai factory will make extensive use of ABB’s SafeMove2 software, which allows people and robots to work safely in close proximity. In addition, ABB’s YuMi robots will allow close collaboration on many of the small parts assembly tasks needed to manufacture an ABB robot. ABB was an early entrant in the China robotics market and the first global robot supplier in the country to have a complete local value chain, including R&D, manufacturing, system integration and service. Through close customer collaboration, ABB has helped introduce many “firsts” to local manufacturing including: China’s first automotive press, welding and painting lines; the first assembly line for mobile phones; and the first automated press line for white goods. 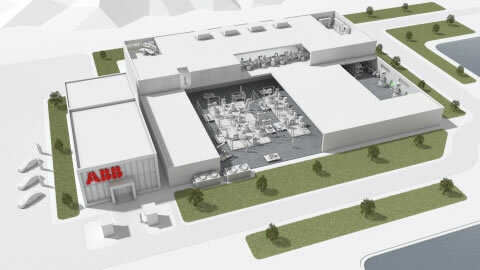 The new Shanghai factory – with a comprehensive R&D center onsite – will become a key part of ABB’s global robotics supply system, together with the company’s recently upgraded factory in Västerås, Sweden and its factory in Auburn Hills, Michigan, where ABB remains the only global robot supplier with a US manufacturing footprint. To learn more about the factory, watch the video.